The Green Joint has been “growing” and people are taking notice. We are humbled by the positive vibes sent our way from our local communities and have recently been named the #1 dispensary in Aspen, CO in addition to our 5-year run as the Gold winner of the Glenwood Springs’s Local’s Choice best dispensary Award! Take a tour to learn about how we got here and the exciting products that we grow with pride and love to deliver to our beloved customers. 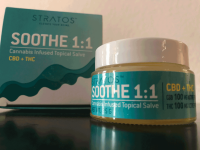 New “Soothe” cannabis infused salve from Stratos is taking over! Cannabis loves Blueberries – enjoy the benefits of both! Indica vs Sativa, whats the difference? We’ve Made the Leafly List! It’s 2017! Can you believe it? We are still celebrating the New Year in a HUUUGE way by offering YOU some of the best specials we’ve ever offered! Make sure that you take advantage of these January only specials, because like 2016, they’ll be gone before you know it. The Strawberry Cough is a very potent strain that tastes exactly how it sounds – absolutely delicious! She is bred for her euphoric, anti-anxiety high, that is mostly sativa (approx. 75% Sativa 25% Indica).